This game actually starts out a little different than most LEGO games because you begin by creating your own LEGO villain, complete with customizable looks and super powers. And your character plays a big part in the story, too! As you play the main game, you’ll be able to get even more powers for your created hero. Since LEGO toys are all about creativity, it’s nice to when the games encourage that, too. But otherwise, the game is like any other in the block building series. Sock enemies, bash blocks and build new LEGO structures, drive vehicles, use teamwork, and solve puzzles. Collect LEGO studs to buy new characters to use in Free Play, and find hidden red and gold LEGO bricks to unlock cheats and other goodies. Just like the other games, a second player can join in and hop out at any time for some co-op fun. Levels are found in a hub world that contains both Gotham City and Metropolis, as well as Smallville, the Joker’s amusement park, and more. Hidden in the hub world are all sorts of side missions and secrets, too. At 20 levels, this is one of the bigger LEGO games, although a handful of those stages are rather short. There are 15 main levels in the story, and about half a dozen mini side story stages. Really the only problem I had with the game is that sometimes the goals and objectives were a little unclear, but that’s about it. Just another solid LEGO entry for DC comic book fans. 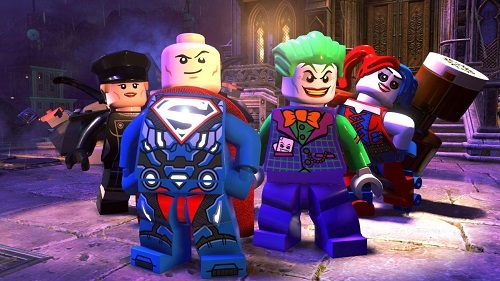 LEGO DC Super Villains is rated E-10 with an ESRB descriptor of Cartoon Violence. You can punch, shoot, and zap LEGO people, but they just fall down or go to pieces when defeated. They make it perfectly clear that everything is made out of LEGOs, so violence isn’t really that bad. Even though you play as bad guys, when you defeat one of the heroes, you both take a selfie and they’re usually both smiling or looking silly, so it’s just all goofy fun. And even though this game is about the bad guys, the heroes do get plenty of play time, too. As bad guys, sometimes you can get into a little mischief by painting graffiti and whatnot, but at least it makes sense when you break all sorts of LEGO bricks in the game! If there a LEGO game that would be good for older kids, it would be this one as it’s slightly edgier. But that doesn’t mean little kids can’t enjoy it, too. In fact, one of the new things they added to this game was a beginner’s mode for people new to LEGO games. LEGO titles have been out for a while, so there are probably a whole group of new kids in this generation that are new to the franchise, so I think that’s a great idea to add into the game. I’d be OK letting any kid play any of the LEGO games, personally. If you are defeated, you just appear right back where you were with a minimal loss of studs, so it’s not too frustrating. Even though the game has tons of spoken voice, reading skill is still helpful for the menus and tips. If a younger player does need assistance, another can join in at any time. Which is always recommended, as LEGO games are more fun with a friend anyway.